Nigerian Presidential Election Delayed; Has 2 Front-Runners Officials blame "challenges." In Africa's most populous country, President Muhammadu Buhari is trying to hold on to his position, and opposition leader Atiku Abubakar is his fiercest challenger. 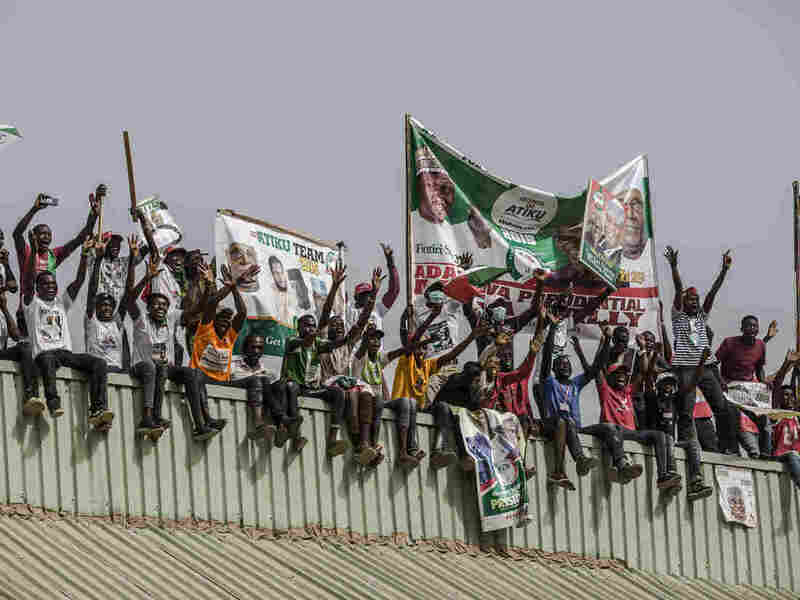 Supporters stand on a roof with placards and banners as they attend a campaign rally of the Nigerian opposition leader Atiku Abubakar on Thursday in Jimeta, eastern Nigeria. Buhari "was the first opposition candidate ever to defeat an incumbent president four years ago," as NPR's Ofeibea Quist-Arcton reported. That transfer of power was peaceful, though previous elections have seen deadly violence. The candidates signed a pact Wednesday aiming to keep the vote peaceful. "This government will do its very best to ensure that the 2019 elections take place in a secure and peaceful atmosphere," Buhari has vowed, as Quist-Arcton reported. Both Buhari and Abubakar are Muslims from northern Nigeria. The previous leader, Goodluck Jonathan, is Christian and from the country's south. Buhari, a former military leader, ruled Nigeria for several years in the 1980s. But he has repeatedly emphasized that he has embraced democratic values and pledged to use a second term to take the country to the "next level." "As a military Head of State, young and rather ruthless, I did things a certain way," he said recently. "Now, as a democratically elected President, I have to do things differently. A lot of what I'm doing now is based on the lessons I have learned from previous experiences." Buhari's term has been plagued by his health problems; he has spent months in the U.K. for medical treatment. He took office vowing to fight corruption and fix the flagging economy. But analyst Mannir Dan Ali tells Quist-Arcton that his record is checkered. "Most Nigerians feel that they are poorer now than when he took over. So the economy is the most important thing," he said. That's true of 29-year-old Adama Daniel, who works at a tailor shop in the city of Gwagwalada and spoke to The New York Times. Buhari "had four years and couldn't do anything," said Daniel. "Another four years won't make a difference." He said he's voting for Abubakar. Abubakar, a former vice president, comes from a business background. He's campaigning on a promise to "wrest certain powers away from the federal government," as the AP reported, but is "dogged by corruption allegations." It's expected to be a tight race. For example, Bloomberg quizzed eight analysts about whom they expected to win. Four said Buhari, four said Abubakar. And regardless of who wins, it's likely that more Nigerians will actually cast their votes than ever before. The local Vanguard newspaper reports that some 84 million people are registered, which is an increase of 20 percent from the 2015 election. The winner will have to reckon with both economic challenges and continued violence in parts of the country. As Quist-Arcton noted, "Herder-farmer conflicts in central Nigeria have cost hundreds of lives while the Boko Haram insurgency continues in the northeast."